Today’s market really tests any bullish resolve that may have developed over the weekend. The financials were especially hit hard due to reported layoffs at Citigroup (C) - the shares hit a five year low. This level of technical damage has in the past marked the end of selling pressure in this most recent secular bull market. Will it do so again this time? Just remember that there is no magic to lines on a graph, price can and will do anything. This particular measure can go all the way to zero (and it has before) and stay there for some time. To understand this ratio better, a little explanation is in order. Usually I watch the area in 0.4 to 0.5 but the spikes lower occur when the percent above 50 day moving average goes lower while the 200 day moving average sits at a higher level. It is telling when the long term uptrend is strong and we only see a short term weakness. Right now we don’t have that because both the short term and the long term are weak and stretched to the downside. 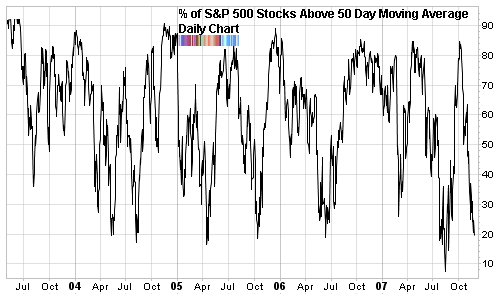 The percentage of stocks above their 50 MA is 19% while the percent above the 200 MA is at 33%. 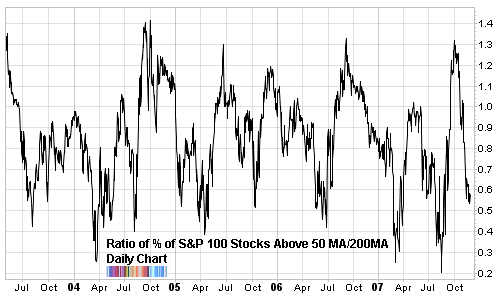 The last time the percentage of stocks above their long term moving average was lower was in the jaws of the bear market in late 2002. Is there any indicator that one can use to generate the plots in this article? tj, I’m not sure what you mean. I take the two statistics and then divide them to get the ratio.